Whether going on a long trip or a short one, back seat passengers always struggle to charge their devices and use them at the same time. This is the PERFECT Car Charger for THE WHOLE FAMILY with 2 RAPID CHARGE USB ports in the front and 2 RAPID CHARGE USB ports at the back, in an ELEGANT and PREMIUM design. 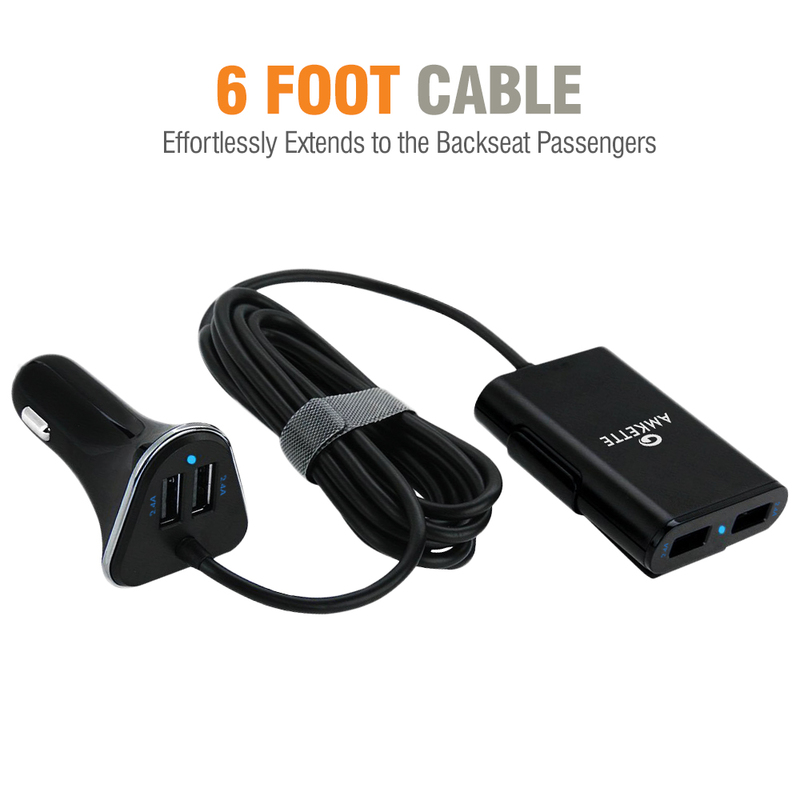 Conveniently ADD 2 USB CHARGING PORTS in the BACK of your car with the 6 foot extension cable, and the unique Clip-it-or-Stick-it design. With Amkette’s proprietary 3 LAYERS OF SAFETY your expensive smartphones & tablets are PROTECTED against OVERCHARGING, OVERHEATING and SHORT CIRCUITS. 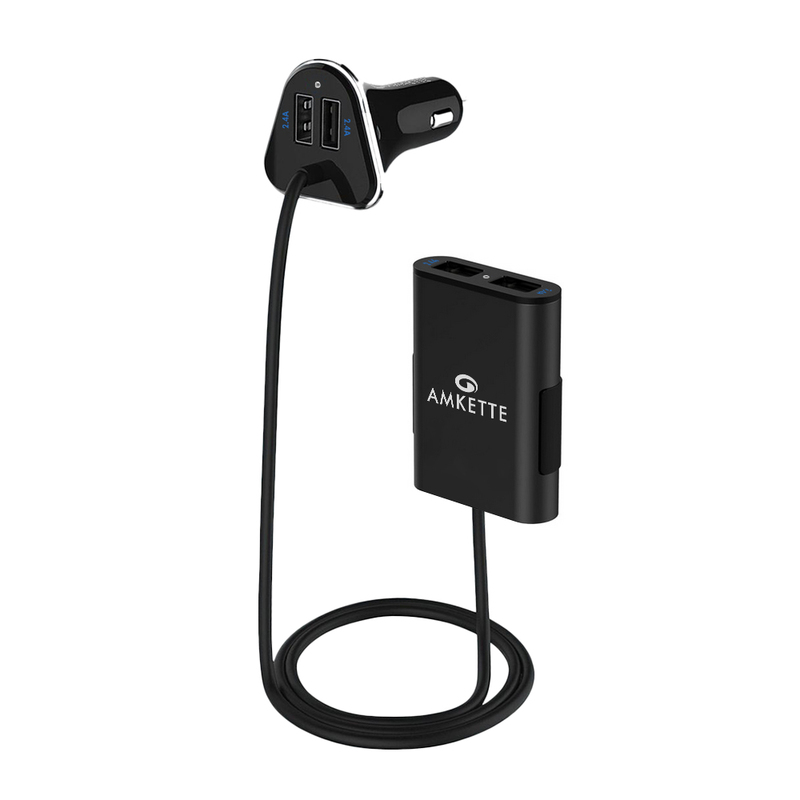 The smartly designed, Amkette Family Car Charger comes with 4 USB ports (2 Front and 2 Back), all with enough power to charge even the most demanding devices – RAPIDLY. 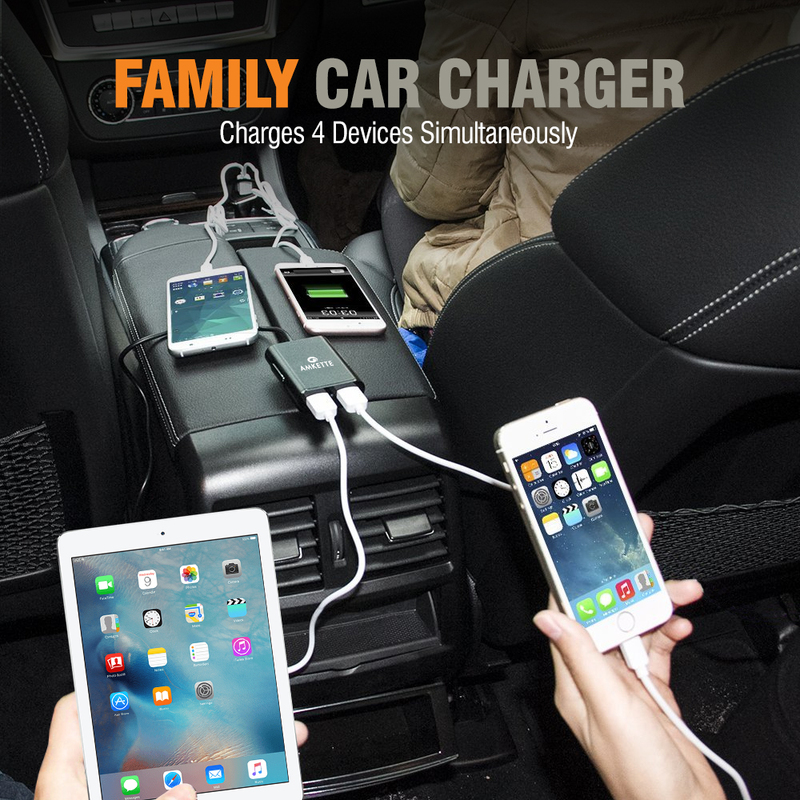 2 Rapid USB ports connected with a 1.8m (6 feet) extension cable come along with simple and clean clip-on or stick-on that let backseat passengers comfortably use and charge their gadgets simultaneously. 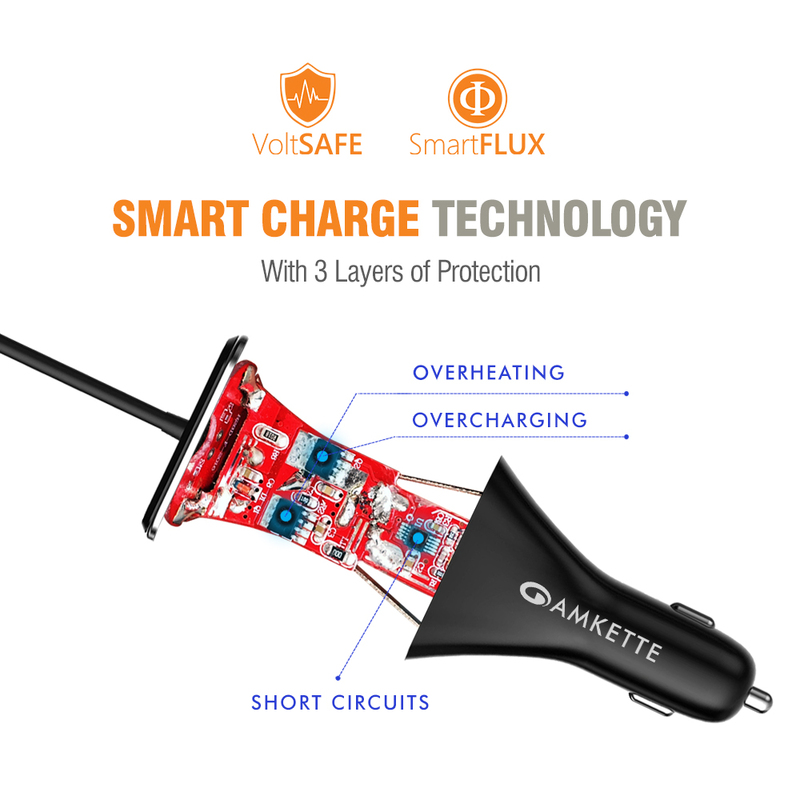 With Amkette Family Car charger Be smart, don’t compromise. 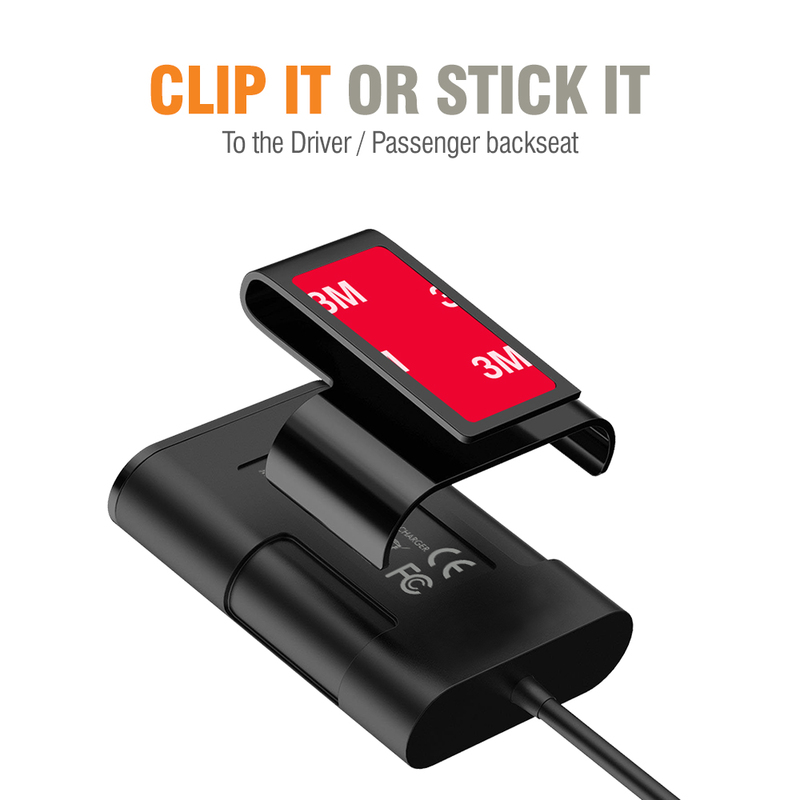 The mounting options offered by the removable clip and 3M tape are considerably good for most in-car interiors. With this built-in 6ft. charging cable, the USB hub can be flexibly attached to anywhere that suits you and your vehicle best. Amkette’s proprietary 3 LAYERS OF SAFETY ensures your expensive smartphones & tablets are PROTECTED against OVERCHARGING, OVERHEATING and SHORT CIRCUITS. 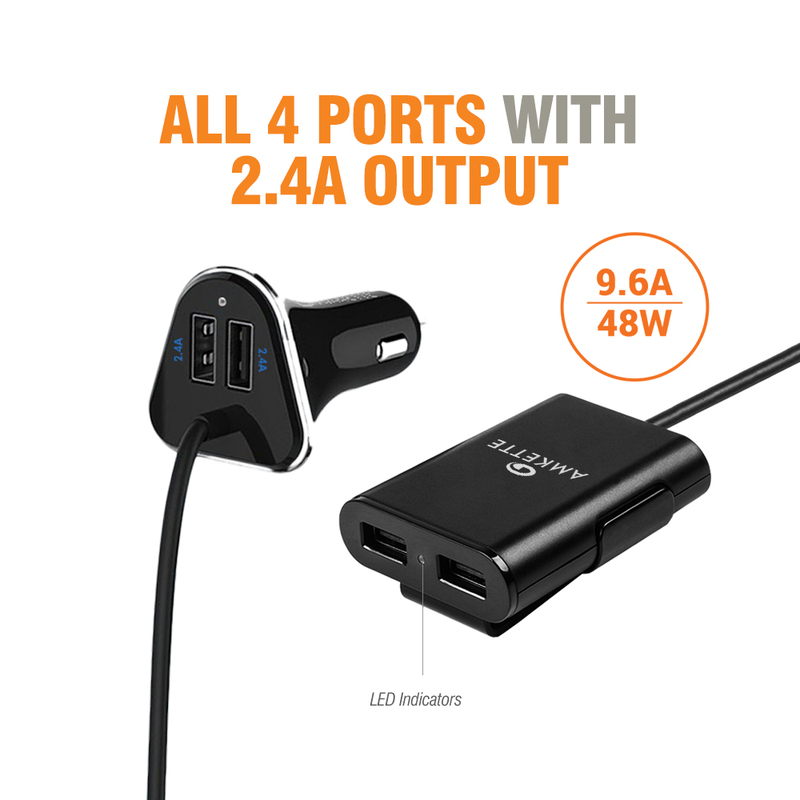 To fulfill the high-power demands of beefy modern smartphones and tablets PowerPro comes with all 4 USB ports with 2.4A output, which can charge your 4 devices(smartphones/tablets/speakers/cameras,etc) simultaneously.ALL at the fastest speed possible. 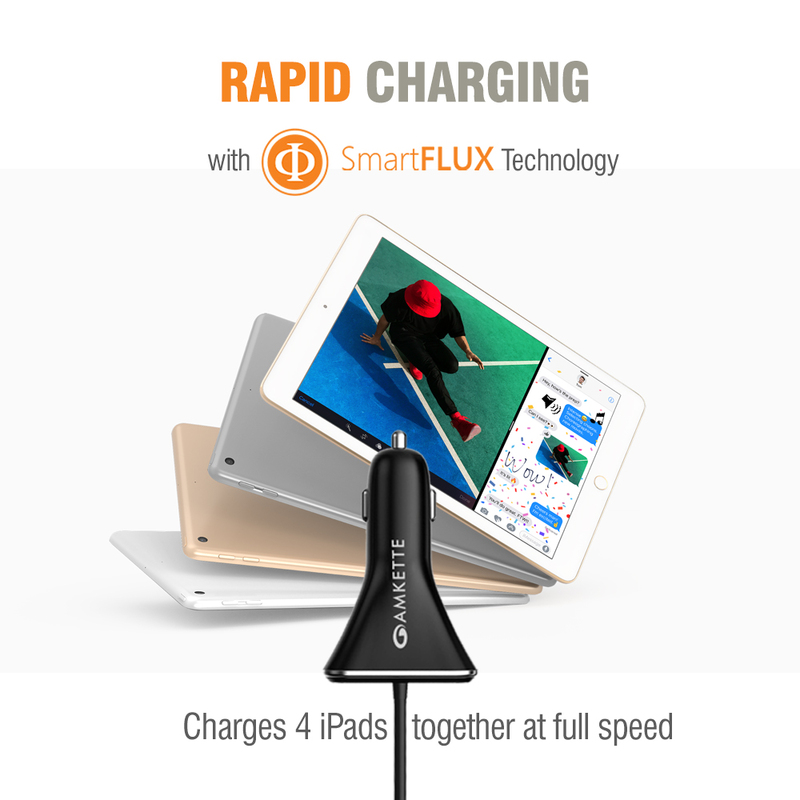 PowerPro efficiently charges any device supporting USB cable charge, be it your iphone/ipad/ipod/Android smartphones/GPS unit/portable speakers/Cameras/smartwatch and whatnot! All our products are passes immense quality checks before they reaches you. But just in case you face any issue,PowerPRO comes with HASSLE FREE 1 YEAR WARRANTY from a company that has valued CUSTOMERS for over 30 YEARS. So buy with confidence, when you buy with Amkette. HASSLE FREE 1 YEAR AMKETTE WARRANTY Against Manufacturing Defects. Warranty HASSLE FREE 1 YEAR AMKETTE WARRANTY Against Manufacturing Defects.